One thing is almost always certain in the run up to any historical anniversary, public commemorations and that is the release (or re-release) of books about that particular anniversary. 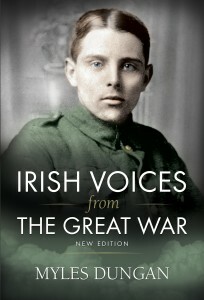 It is therefore no coincidence that this book Irish Voices from The Great War has been re-released at this particular time to tap into the interest which the hundredth anniversary of that war inevitably brings. The original (They shall not Grow Old, Irish Soldiers and the Great War) was released in 1997. The gap between the original and current release dates can be seen as milestones in evolving Anglo-Irish relations; the original release in the mid 1990s arrived at a time when the Northern Ireland Peace Process was in it’s infancy, to the current point where official Ireland and Britain are commemorating such anniversaries on a joint basis to demonstrate a shared past, and a present of mutual respect. Dungan’s book shed, much light on the involvement of Irish men of all backgrounds in ‘The Great War’, during a period when it simply wasn’t a popular notion in some circles. There can be no doubt that Dungan contributes to this idea of a shared past. His earlier edition shed much light on what had been a forgotten aspect of Irish history, the involvement of Irish men of all backgrounds in ‘The Great War’, during a period when it simply wasn’t a popular notion in some circles. Today there is much more acceptance of this idea. The concept of promoting a shared past in relation to the Great War has, in many eyes superseded the realities of that war, to the point that (to borrow a phrase from an unnamed historian) a fetishism for commemoration takes over, blurring or ignoring the reasons why many signed up in the first place, or the circumstances in which they died. Of course a simplistic approach to history is to be accepted in public commemoration. The loss is remembered, whereas the reasons for the loss are sometimes relegated to the background. What we expect from the copious volumes of works on those events, is a much deeper analysis than the pomp and pageantry of officialdom. Dungan provides this with his analysis of the battles and campaigns, through which he weaves the narratives of many of the young men from throughout Ireland who took part in these bloody battles, in what was four disastrous years for humanity. Before the graphic retelling of the battles at Gallipoli, Sulva Bay and the Somme commence, Dungan attempts to familiarise the reader with the lay of the land, in terms of the approach taken by the various battalions. His description of troop manoeuvres show the distances which had to be travelled on foot to strategic points, bringing in everything from the unfamiliarity of the terrain to weather conditions, to the point you begin to feel what the strain on the body must have been like for these inexperienced soldiers. In describing the battles themselves, a lot is of course added by eyewitness accounts of the horror of war, nevertheless there is rapidity to Dungan’s style which goes someway to illustrating the pace and confusion in the midst of battle. To the uninitiated the different platoons and battalion names may confuse. Perhaps, not unexpectedly, given the number of Irish casualties and its continued significance to commemorations in Northern Ireland, the Somme is afforded special attention. However, the lesser explored Irish involvement in the Somme with The Sixteenth (Irish) Division is also brought in alongside the Ulster Division. The Sixteenth and The Thirty Sixth (Ulster) Division are afforded a chapter each. Although in some respects their experiences were different, there were many similarities, and assigning a chapter to each is a good juxtaposition, showing the different traditions and different reasons for joining, with pretty much the same outcome. Of Gallipoli, Dungan calls the planning ‘that morass of incompetence’ and is equally critical of the British High Command at the Somme. Again, the carnage and confusion of the events are graphically and expertly retold. The sense of awe and foreboding among the soldiers is clearly evident. “The slopes of Thiepval run red with the blood of Ulstermen – dead in heaps, dying in hundreds. God above us this is glorious war! Huddled together, surrounded, the end is near”. (p.137) However, shining through this chaos and despair are the important stories of the individual acts of heroism from the ordinary soldiery. As the title suggests, this work is about exploring the Irish voices of the war, which up until a point had been forgotten. This book presents a large number of Irish voices for consideration. However, they are more often than not, from certain sections of Irish society, mainly coming from the middle-class to the upper echelons. Educated and well connected Officers are well represented with their testimony. Those further down the social scale are also represented, in many instances by correspondence to their families back home. Such resources are utilised to full effect by Dungan, showing the despondency felt by frightened young men as they waited for their inevitable demise. The language contained within letters is noticeably different to that of the composed Sergeant writing in his journal after the fact. However, on occasion, they contained the same sentiments of fear and desperation. The ‘voices’ used frequently are pro-union voices. Nationalists are less often heard. It may, however, be said that there seems to be a feeling that the ‘voices’ used frequently are pro-union voices. This is evident from the beginning, and is most apparent with a chapter dedicated to the dairies of ‘convinced Unionist’ Captain N.E. Drury of the Dublin Fusiliers. This is not a criticism of the author as such, nor would it be true to say that there are no ‘nationalist’ voices contained within, it perhaps highlights how deep nationalist Ireland’s involvement in the war was buried by subsequent generations, that much of the testimony from nationalist combatants went unrecorded. It is the theme of respect that the reader will find permeating through this book. There are examples of respect shown by soldiers to their fellow countrymen of different ideologies, as well as the respect shown by the author to all of his subjects. However, justified criticism of the senior ranks is obvious, and while there isn’t blanket criticism of the leaders (the author contends that sometimes the Generals ‘got it right’), there is a strong sense of empathy with the men who risked all over those giving the orders. Public commemorations of war are fleeting, symbolic, all-encompassing to include those giving the orders and those obeying, and paying with their lives. It doesn’t of course make for ‘good history’. What Dungan has achieved with Irish Voices from The Great War, is more of a monument to those forgotten men who died in a dubious war than any public commemoration, no matter how well intentioned, could ever achieve.